Hunger is the signal telling us we are running out of essential fuel! In the natural, it starts when our stomach is empty but quickly messages the brain to activation. I may be able to ignore my stomach, but it is much more difficult to ignore my thoughts. 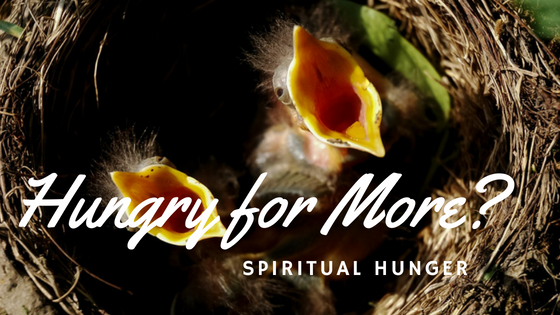 Do I as acutely sense spiritual hunger? How do I respond when I’m hungry? Hunger is the feeling of weakness or discomfort caused by lack of food. It triggers the desire to eat or crave food. Am I hungry for more of God? Do I choose to satisfy my spiritual desire through Him or other sources. At times after finishing a pleasant meal and feeling fully satisfied, if I catch a glimpse of some sweet delicacy impulsively I want more. How about you? This is actually normal! God made us to always be on the lookout for more; He has designed us to never be empty. Heidi Baker, missionary to Mozambique, often affirms “The hungry are always fed.” The hungry, in desperation, push to the front of the line. They will not be refused! God has allowed us to recognize natural hunger through the discomfort of painful hunger pangs. If we ignore our bodies long enough hunger actually subsides. The same is true spiritually. He has also built within us an awareness of spiritual longing and hunger. Hunger ignored has a price tag; vital organs can be irreparably damaged. We cannot safely ignore spiritual hunger either. The Spirit within us is constantly inviting us to enter the Lord’s Presence and feast in His abundant provision. There are no shortcuts to resting, waiting, worshiping, or meditating on the bible. Junk food goes beyond chips, coke or a bit of chocolate. Time can never be regained! How we spend our minutes forms life patterns shaping our identity. The unceasing demands of our physical bodies and fleeting attractions can be the greatest hindrance to wholesome feeding of the Spirit. and the Spirit what is contrary to the flesh. We will either reach for what is good and truly satisfies, or what temporarily tastes and feels good. Daily we choose! There can be unrealistic expectation that faith will be a pleasant journey of “always full”. Not so! The Spirit purposefully led Jesus to a wilderness of prolonged hunger. In the place of hunger, what Adam lost in the fall Jesus began to reclaim. After forty days of hunger the Tempter comes! His timing is usually the same for us as well. When hungry, angry, lonely and tired, halt! This is a place of vulnerability. Jesus, the Living Word, stood His ground against every assault of the evil one. Bread will never satisfy our deepest hunger! Neither will lust, money, power or position! Our relentless deepest hunger is satisfied in God alone. When we go to God for every need to be met, we too will experience supernatural provision. One of the names for God is Jehovah Jireh. It means “the LORD will provide”, or “the LORD our Provider.” Provider is who He is! In the Lord alone is provision for all we need! Our hunger is meant to draw us to The One who provides. Jesus gives us a life-giving promise. Not only is He the Lord our Provider, he is the Lord our Righteousness! Ultimate filling is complete in Him. Our personal wilderness journeys are ultimately meant to accentuate our hunger. The hot dusty road heightens and stresses our hunger and thirst for more of Him. It is a good thing! Without hunger pangs, we would not survive. Are you hungry? I hear it all around me! I see it among the young and the old! People of every nationality, demographic and generation, crying, “More, Jesus! More of You!” The hunger is increasing, and it is good. People are turning their hearts and eyes from temporary satisfaction to ultimate fulfillment. It is beautiful! Prayer rooms are filling up! The birds outside my window rouse me at three in the morning. Long before the sun breaks the darkness of night, pangs of hunger stir little nests with cries for more. One hungry little chick has an ability to awaken an entire nest. The feathered chatter shifts from nest to nest until the whole community is alive with the sound of awakening. Let us take a lesson from these little feathered ones, we can never be too greedy for more of God; “open wide (your) mouth”. ← Flying Lead Change! Following God’s Lead!